Those two words don’t go together, do they?? Um, yes, yes they do! 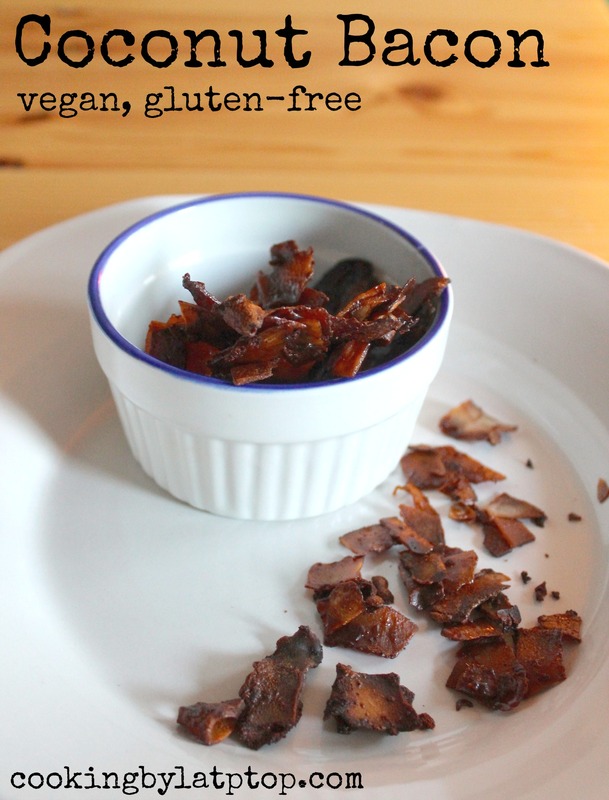 So… I have been on a quest for the best vegetarian bacon. But this–you can make this. And the joy of making your own is that you get to have it how you like it. Like your bacon to be more candy-like? Add more maple syrup. Like a little kick? Add some chipotle. Like it really smoky? Add more smoke. It’s all up to you. This is dead simple to make, requires no particular skills but patience. You have to let it sit for 24 hours for the coconut to really drink in the smoky, salty goodness, and it takes a while to bake, as well. But trust me when I say, the end result is so worth it. Crispy, smoky, salty. Just like good bacon should be. Pretty much everyone who’s tried this, vegans and meat-eaters alike, has raved about it. Give it a try. 3 handfuls of large-flake coconut (about 3 cups). You can get this at health-food stores, I got mine in bulk at the Dand-D-Mart. Put all the marinade ingredients into a large, glass mason jar, and shake ’em up good until they’re well mixed. Then add the coconut, and shake it until all the coconut is covered in marinade. If it looks a little thick, you can thin it down a bit with a little water. Place in the fridge for 24 hours, shaking occasionally. Preheat the oven to 300 degrees, and line a baking sheet with parchment. Drain any remaining marinade off of the coconut. You can leave it on, but it’ll just take longer to cook. Place the coconut in a single layer on the baking sheet. If you like a more candy-like bacon, pour the marinade evenly over the coconut. Bake for 20-25 minutes, or until you get it to your desired level of caramelization, stirring every 5-10 minutes. Allow to cool. When cool, you can scrunch it up inside the parchment paper to break it up, kind of like how you would do with granola. Store in the fridge, and use on caesar salads, sandwiches, or on veggie burgers. Wow! for the record, its great out of the jar while marinating! I’m trying to wait 24 hours but I may need to just eat this whole batch and then try again another time! …thanks, so good! looking forward to actually finishing the recipe some day too!